Interesting and engaging ready-made newsletters you can edit as much as you wish. That's how you make them really yours. You will also receive further daily emails about newsletters and our service. You can, of course, opt out of receiving these at any time. Way too busy to write a newsletter... but can't find a ready-made one that makes you feel good? Our newsletters are smart, engaging and help bring you more business. Each month we provide you with templates for printing and templates for emailing. They're complete with content, but you can change them as much as you want to add specific info and personal stories. They'll like what you send - and that means they'll like you too. Most customer newsletters are boring and insult your clients' intelligence. That's bad for you and bad for business. We believe in helping you form a real relationship with your clients. 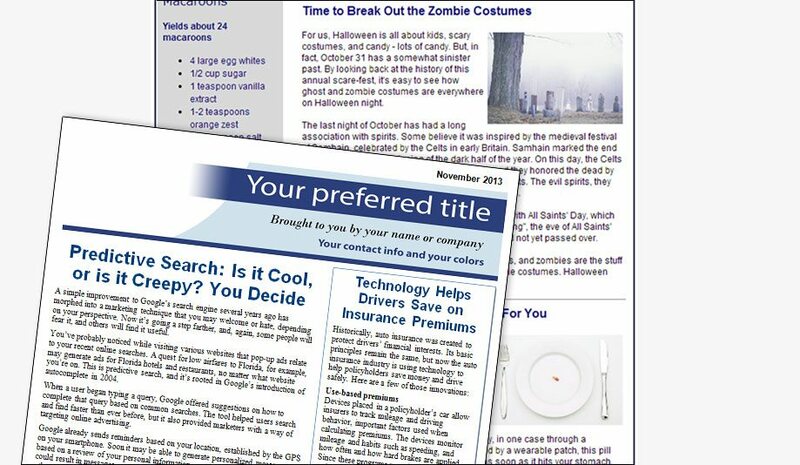 We give you 2- and 4-page print format templates, complete with content. And there are versions to put in an envelope and versions to send without one. We’ve partnered with Active Campaign, the leaders in email newsletter delivery, to give you the best chance of getting your newsletters through spam filters. Send 1,000 emails per month (or more for a small extra fee). There’s plenty of information to keep your clients reading. What’s more, they’ll value the services you provide when they have a better understanding of what you can do. Our content makes a great start, and then you can change them as much as you wish to add your own business’s flavor. Discover who your most active clients are when you download your entire list to see who opened your newsletters, clicked on links or unsubscribed. Every business owner should be passionate about what they do. This is why we make newsletters. If you send out a newsletter on a regular, monthly basis, we promise you that you will have more repeat business and more respect from your clients. It’s our passion to help as many people as we can reach that position. We've got a whole range of things to support your newsletter program. From lead collection to social media to website articles - we've got you covered. Whether you want to keep in touch with your leads or your existing clients, we've got you covered. Sending regular (interesting) information will keep your name in front of them. Mixing it up means they'll read it, not trash it. Think Kiplinger crossed with a bit of The New York Times and a little of BuzzFeed. There's something here to make your clients' lives better - something to brighten their day. We believe in newsletters - and we are here to give you customer support every step along the way. We don’t believe in taking your money and then ignoring you. You can reach customer support by email and phone. All our writers are in North America. Our articles are edited by a professional editor and then proofread to remove any errors. Your newsletter comes personalized with your contact info, logo – even your headshot, if you want it. That means you can send it right away – and then get back to what you do best: working with your clients! We don’t believe you should pay until you’re happy with your newsletter. That’s why we insist you try it free for 30 days before paying for your subscription. You will get access to everything during your trial period. You can send your newsletter when you want to – not on some fixed schedule. Plus, you can send as many or as few newsletters as you want. After all, it’s your newsletter to do what you want with! It’s easy and quick to use. I take bits and pieces from the three newsletters to tailor to my clients. I get a lot of good feedback from people, and I look like a superstar whose done a lot of work. I know we’re not your only client, but you do a great job of making us feel that way with your prompt and attentive support. Thank you for all your help with setting me up with my monthly newsletter to go. From our first conversation through the entire process you were personal, hardworking, diligent and always had my best interest in mind. I found your website and the ability to customize my monthly newsletter very easy to navigate after your tour. I also appreciate you are always here for me to answer any questions I may have or to help me out with my newsletter should I run into any problems. I mail out 2,500 newsletters a month and emails to another 600 clients. I have had great success and my business has improved substantially. I love the service. I use both the email and print versions all the time. Articles are informative and its easy to customize. I can’t imagine how long it would take me to produce this myself every month! Still Have Questions about our newsletters? How much of my newsletter can I customize? As much or as little as you wish. You can change as many articles as you wish – even the title. Or you can leave it as it is. How do I customize my newsletter? Print: You can use Microsoft Word to cut and paste text into your newsletter quickly and easily. Online: You can use Active Campaign’s easy-to-use email editing window. We give you a free account with Active Campaign for editing and sending out your newsletters. What do I do if I want to discontinue my service? Just email us at [email protected] or call 1-877-976-6368 and we will cancel your account immediately. How do I send my email newsletters? We give you a free account with Active Campaign, the leading email sending company. You can send 1,000 emails per month with them as part of our service. If you want to send more than 1,000 emails, it costs $1.50 per 100. Can I track the performance of my email newsletters? Yes, you can. Active Campaign provides tracking of opens, clicks on links, unsubscribes and bounces. You can also see what each individual recipient did with the newsletter. Are these newsletters FINRA pre-approved? The content is written to comply to FINRA guidelines. However, they are not pre-approved by FINRA. It is up to you to make sure your marketing is in compliance. What kind of files will I receive? Print: You will receive Microsoft Word files so you can easily customize your newsletter. Online: You will have access to the email editing facility through Active Campaign, Ready to Go Newsletters’ email delivery partner. We also provide HTML files, in case you want to use the newsletter with another system, such as Constant Contact, iContact or Infusionsoft. However, if you don’t use Active Campaign, we will not be able to personalize your newsletter for you. Will I get the current month’s newsletter? Yes, you will. Indeed, it’s likely you will have access to the current and next month’s newsletters during your free trial period. How quickly can I start? Your first newsletter will be set up within two working days. Then you’ll get access to each fresh newsletter around the 15th of the month before (for example, September's newsletter is published August 15). Do your email newsletters comply with the anti-spam regulations? If you use our partner, Active Campaign, your newsletters will comply with anti-spam laws. The system automatically includes a mailing address and an unsubscribe link. Print and email financial planner and investment advisor newsletters to help with your marketing. Use our ready-made newsletters or ask us to build a custom newsletter just for you.